Penshurst Place is the ancestral home of the Sidney family, and was the birthplace of the great Elizabethan poet, courtier and soldier, Sir Philip Sidney. It has been owned by the Sidney family since 1552; after passing through the hands of two of Henry IV’s sons, followed by Henry VIII who used it as a hunting lodge. Given to Anne of Cleves as part of her divorce settlement from Henry VIII, it was then briefly in the hands of Sir Ralph Fane and was finally gifted by Henry VIII’s son, Edward VI, to his loyal steward and tutor, Sir William Sidney. The original medieval house is one of the most complete surviving examples of 14th-century domestic architecture in England and was built in 1341 for Sir John de Pulteney, a London merchant and four-times Lord Mayor of London who wanted a country residence within easy riding distance of London. This was at the time when such properties ceased to be castles: they were more dwellings that could be defended in an emergency. When Henry IV’s third son, John, Duke of Bedford, occupied Penshurst, the second hall, known as the Buckingham Building, was built: so called after the subsequent owners, the Dukes of Buckingham. Edward Stafford, 3rd Duke of Buckingham was executed in 1521 by King Henry VIII following a lavish feast held at Penshurst Place hosted by the Duke in honour of Henry. It then stayed in the crown estate for the rest of his reign; with documented evidence Henry used Penshurst Place as a hunting lodge; visiting with his courtier Brandon. 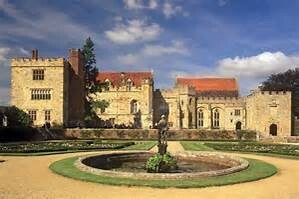 The property being only a few miles from Hever Castle; childhood home of Henry’s second wife Anne Boleyn.